Ben Stiller’s Walter Mitty is a man who goes to work and pays the bills—until he gets fired when Life Magazine goes digital. Life, it turns out, was so twentieth century. As Mitty and his colleagues act out the downsizing drama, he is finally pushed to make real the adventure dramas of his daydreams. Why? To get the girl, to get a life, and to get the job done. Mitty completes his final assignment at the magazine even if his new bosses belittle him and can him anyways. Going to work day after day rarely looks like heroism. Running off to climb Mount Everest is something Americans totally understand. Office drones never find their true selves; the oxygen deprived on the other hand always have a good story to tell at the dinner party. Never mind those cautionary tales Jon Krakauer is so good at writing. You know, the one about how climbing Everest is mostly a matter of paying a guide and some sherpas to risk their lives for you. Or that other one about the over confident young man who had read one too many books about the wilderness and ended up starving to death in the Alaskan woods. Funny that it’s been a century now since Charlie Chaplin made his movie debut in December, 1913. 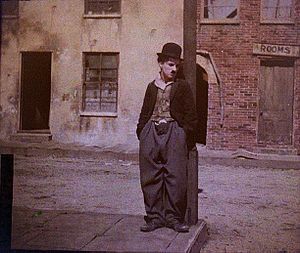 Once the biggest star in the world, Chaplin’s iconic Little Tramp persona was the ultimate little guy. In hard times he often couldn’t hold down a job but made comic magic out of being reduced to eating shoe leather. His repetitive stress injury—a mental breakdown—from working on an ever faster moving assembly line led to the best critique of modern times the screen has ever seen. Stiller seems to throw a nod to Chaplin with a short scene in which his Mitty performs a series of neat tricks on a skateboard that his love interest just misses seeing every time. It’s the kind of small gesture that the Tramp won you over with—the bittersweet display of how an ordinary man might be special, but is rarely recognized. We like our underdogs successful, our Davids always taking down Goliaths. So here’s a New Year’s toast to the shepherds who do nothing more than mind their sheep, even if they daydream of heroism while doing it. This is an interesting theme. It’s a book that’s hard to forget — much more so than Into Thin Air, I think. I love the title of this post: “Into the Ordinary” as opposed to “Into the Wild”.